Some 36% of internet users say that they use just one of the five social media sites specified in this report (Facebook, Twitter, Instagram, Pinterest, and LinkedIn), while 42% use two or more of these sites. The remaining 22% of internet users have not adopted any of the five major platforms we asked about in our survey. Among those internet users who only use one of these five major social networking platforms, 8% use LinkedIn, 4% use Pinterest, and 2% each say that Instagram or Twitter is their sole social networking site. 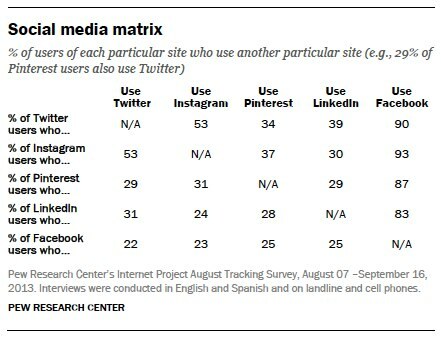 The remaining 84% say that Facebook is the one social networking site they use. Facebook is by far the most commonly-used social networking platform, and as a result, a significant majority of Twitter, Instagram, Pinterest, and LinkedIn users also use Facebook. At the low end, 83% of LinkedIn users also use Facebook. At the high end, 93% of Instagram users also use Facebook (Instagram’s parent company). 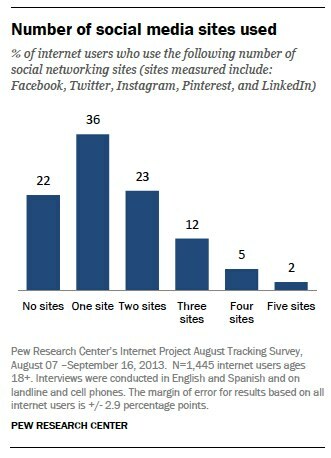 About a quarter of Facebook users use each of the other sites. Turning to sites other than Facebook, a significant level of overlap exists between Instagram and Twitter users – 53% of Twitter users also use Instagram, and 53% of Instagram users also use Twitter. Among non-Facebook sites, this is the highest rate of “reciprocity” between user groups we measured.